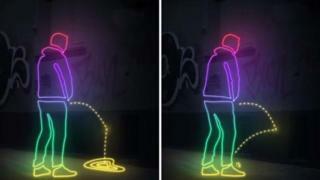 A special wall coating designed to soak anyone who tries to urinate against it is being trialled by a London council. The liquid-repelling coating will be used at two popular drinking locations in Shoreditch and Dalston, east London. Hackney Council spends £100,000 a year cleaning urine off walls and pavements. Feryal Dermici, cabinet member for neighbourhoods, said: "If the prospect of a fine doesn't put them off from weeing in the street, maybe the risk of getting covered in urine will." The treatment creates a barrier that repels liquid, meaning that urine will bounce off the wall and back towards the offender. It is also intended to stop urine soaking into the wall, reducing stains and smells. Ms Dermici urged people to enjoy themselves responsibly and "think about the people living nearby". Monika, a duty manager at Nuffield Health, has to clean up the urine left in Bateman's Row, close to Old Street. She said: "It's not very nice. When I open it's the first thing I go check. People pee in the fire exit. "Sometimes there's sick too. I have to hose it down. "It smells particularly bad after the weekends." On hearing about the new paint, Monika laughed and said: "It's an interesting idea." But she said better lighting would also help. The anti-pee substance is made by US company UltraTech, and creates a near-invisible barrier of air over surfaces. The council, which believes it is the first local authority in the UK to use the repellent, has paid £1,000 to treat the two locations. It does not want to reveal where the paint will be used.